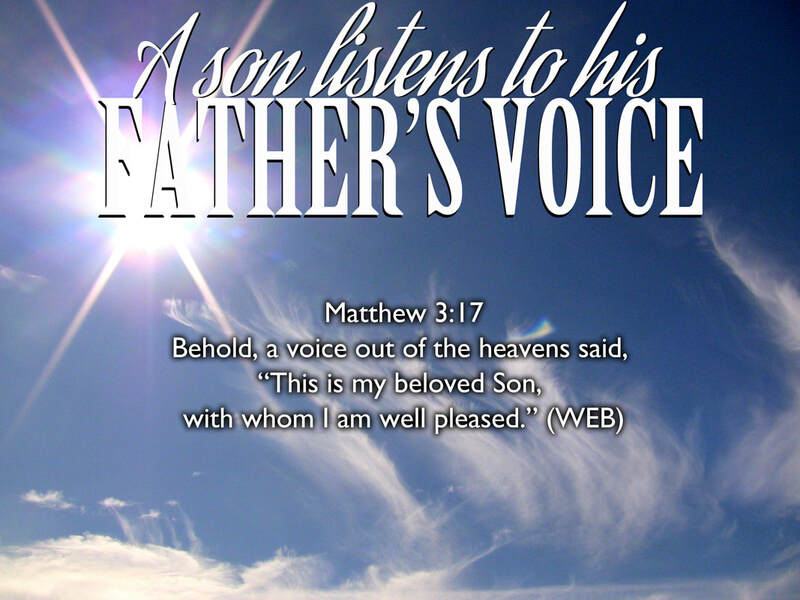 Jesus lived His entire life listening for His Father’s voice. As a matter of fact, He told us that He didn’t even say a word unless He first heard His Father say it! (John 14:10; John 14:24) He always had His ears tuned to the heartbeat and the voice of His Abba. Nothing that Jesus did originated from within Himself. In John 5:19, He told His disciples… “Most certainly, I tell you, the Son can do nothing of himself, but what he sees the Father doing. For whatever things he does, these the Son also does likewise. (WEB) His was a life of complete and utter dependence on His God and Father and His priority was to hear His voice. I think it is significant that the Father actually spoke audibly from heaven at the launch of Jesus’ public ministry when He said… “This is my beloved Son, with whom I am well pleased.” And then He repeated those words near the end of Jesus’ ministry on the Mount of Transfiguration (Matthew 17:25). So it stands to reason that if we are to live a life of sonship, being conformed into the image of Jesus (Romans 8:29), we too, will live a life of listening. Listening for the voice of our Great Shepherd (John 10:27) and listening to the promptings of the Holy Spirit (Revelation 2:7) within us. In Romans 8:14, we read that those who are led by the Spirit of God are really the children of God. In a world that is broadcasting many voices to us every day, it is important that we learn to tune into the frequency of the still, small voice (1 Kings 19:12) that beckons us closer. In the first part of John 8:47, Jesus tells us these words… Whoever belongs to God hears what God says. (NIV) Part of the privilege of being God’s beloved kids is being able to recognize His voice when He calls out to us. I believe the closer that we get to our Abba, the more clearly we will recognize His voice when He speaks. When my own earthly father would call me on the phone, he wouldn't have to identify himself by the words he said. As soon as I heard his voice, I knew it was my dad. Many years ago, I had an experience where I was subjected to a harsh, public prophetic word that seemed to be speaking to some accurate issues in my life. Since God was already speaking to me about these same issues, I thought that this public word that I received might have been from Him. So after I heard this word, I asked God if it was Him speaking to me through this person. I found His response to me quite interesting. All He said to me was... "Barry, did you hear My voice in the words that were spoken?" Immediately I knew what God was saying to me. He was telling me to listen to the tone in the voice and not to just the words said. When I was able to separate the words that were spoken from the spirit in which they were communicated, I realized that I did not recognize my Father’s voice in what was said to me. That experience has helped to remind me to always listen beyond the words so that I can really be attuned to hear Papa’s voice. The closer we get to His heart, the more that we will recognize His voice in our every day life. I really believe that our Papa is speaking to us far more than we realize. He speaks to us through His written Word. He speaks to us through His spoken (Rhema) Word. He speaks to us through prayer. He speaks to us in worship. He speaks to us through circumstances and divine appointments. He speaks to us through open doors and He speaks to us through closed doors. He speaks to us through friends and family and church life. He speaks to us through creation. He speaks to us through the desires of our own heart. And I believe that He even speaks the loudest sometimes in the silence. My prayer is that we would all be able to hear beyond the words spoken and listen for His loving voice in our every day life. He is a good Father and the giver of every good gift (James 1:17). He is not against us as some voices may try to get us to believe. He loves us (1 John 3:1) and He is for us! (Romans 8:31). May every word of judgment and condemnation that we hear from the father of lies (John 8:44) be exposed for what it is and may we have the grace to reject every voice that does not come from our Dad. And may the eyes of our hearts be opened by the Spirit of Wisdom and Revelation (Ephesians 1:17-18) so that we could tune into our Father's voice just as Jesus does.